Something I realized this summer, there are two kinds of barbecues. Some portions of the country call them cookouts, but it’s the same type of gathering. The weather warms up and someone invites you over to their house. Usually, they grill up some kind of meat and you bring the booze. This is where things start to diverge. They are VERY casual. They usually don’t have any (or very much) in the way of decoration if the BBQ is near a summer holiday. 90% of the people at said gathering only know the host and no one else. Regardless of what meat is being grilled, there will be no sides. If you are lucky, there are buns, but probably not. The host only tells you to bring booze even though they should tell you to bring sides or some dish to share. The other types of barbecues are usually a veritable feast. The host asks people to bring booze and sides. The meat, should it be required, always has buns. There is some sort of decoration and always napkins. The bathroom is safe for use and so is the cutlery. You know a few people there other than the host. The patio furniture usually looks like it belongs there. 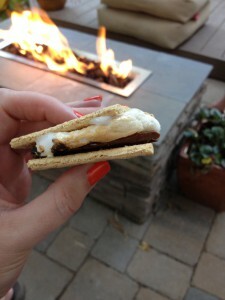 If you are lucky, there are s’mores!